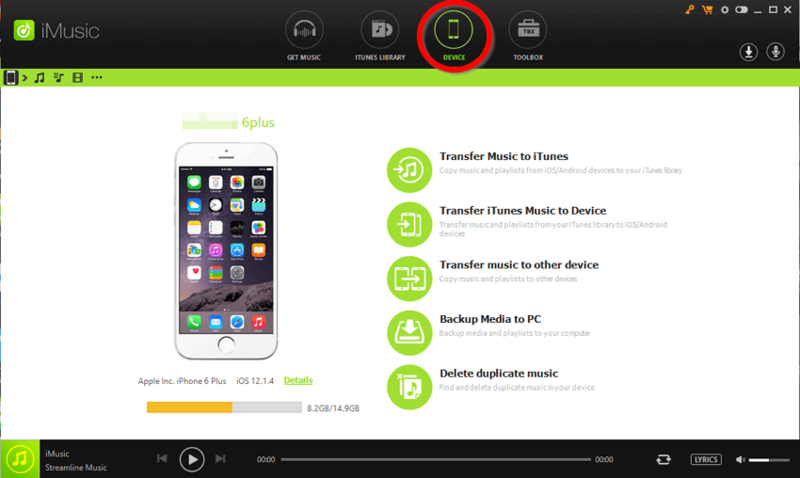 Looking for a good music transfer app to transfer music from iPhone to PC? Well, then you’re in luck! Down below, we’re going to be introducing you to 10 of the best programs available in the market this year 2019. For this, we’re going to be focusing on apps that can initiate a dual transfer between both an iOS device and your iTunes library. However, some of the programs listed might also be known for other features or benefits. Either way, continue reading in order to be introduced to the best music transfer application for both Windows and Mac PCs! Part 3. The Comparison Table Between These 10 Music Transfer Apps, Which one is the Best? The first group of transfer software that we’re going to be introducing are known Windows transfer programs — although a lot of them also have versions available for Mac OS computers. These first five are definitely the best of the best. With basic intuitive interfacing and premium transfer features. This compilation will include everything you need to know about each of the programs. Including the price of the program, where you can download it from, how it works, and the pros & cons of using each program. Price: [FREE Trial Available] $39.95 per year or $59.95 for the lifetime license . 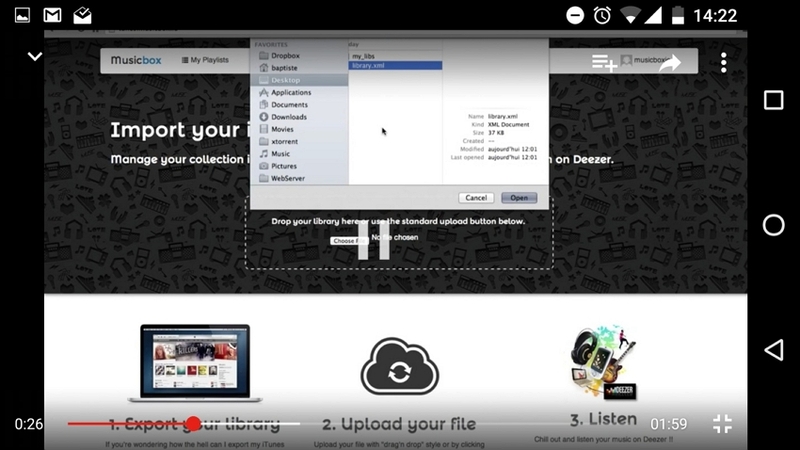 The very first program on our list is the iMusic transfer app (which is available on both Windows/Mac OS.) This is, without a doubt, the best of the best. A testament proved by its sleek and yet intuitive interface, which makes it perfect for beginners and experienced users alike. With iMusic, there’s nothing you ever really need to worry about. Everything that you need for transferring Music between device and PC is made available to you in a way that is easy to use and understand. Equipped with the best music transfer app feature to transfer music /video from iPhone6/7/8/SE/X/XR/XS/XS Max/android to Windows. NO LIMIT Transfer of Music/Playlist from Device to iTunes. Quick and Efficient transfer of Music/Playlist from iTunes to Device. Convenient Music/Playlist transfer between two devices. Full Media backup for future restoration purposes. Duplication Detection System in order to prevent the waste of storage space. You can download the iMusic transfer software from the official website, a FREE trial is available for you to be able to try out its features! Now, upon launching the program, you’ll find four stationary tabs at the top-center of the screen. 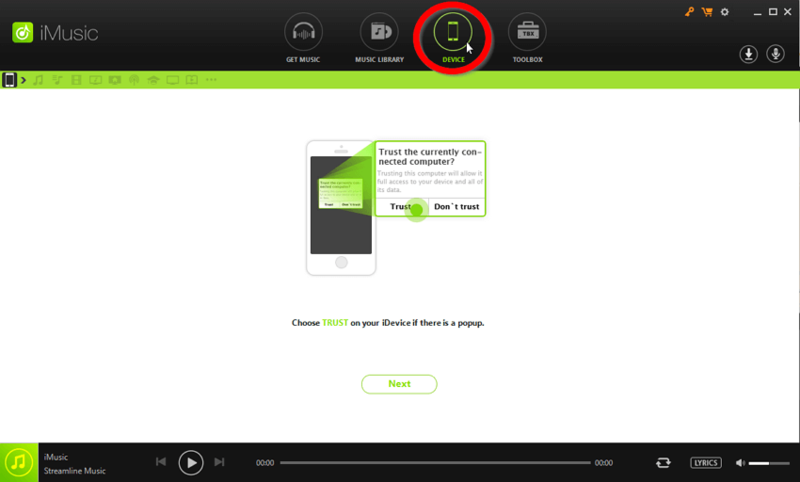 Select the DEVICE tab (marked with a red circle in the image below) and proceed. Once you are on the DEVICE page, you should be able to see the options available for you. 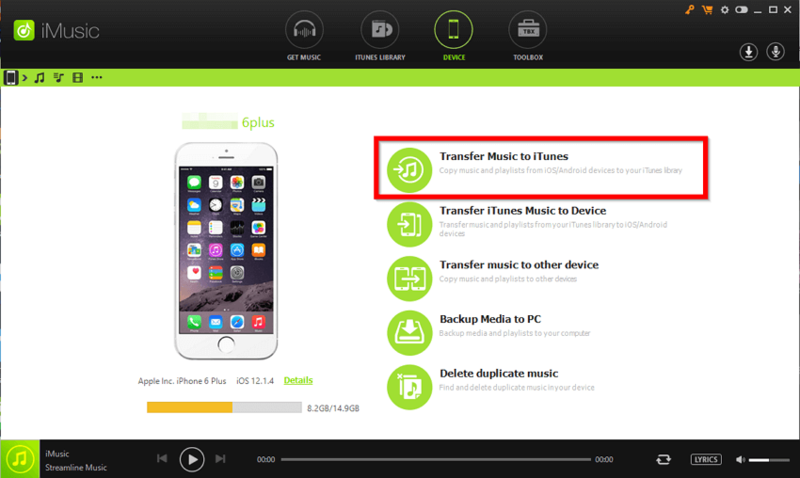 Of course, for our purpose of moving data from iOS to our PC, we’re going to select the Transfer Music to iTunes option! Almost done! 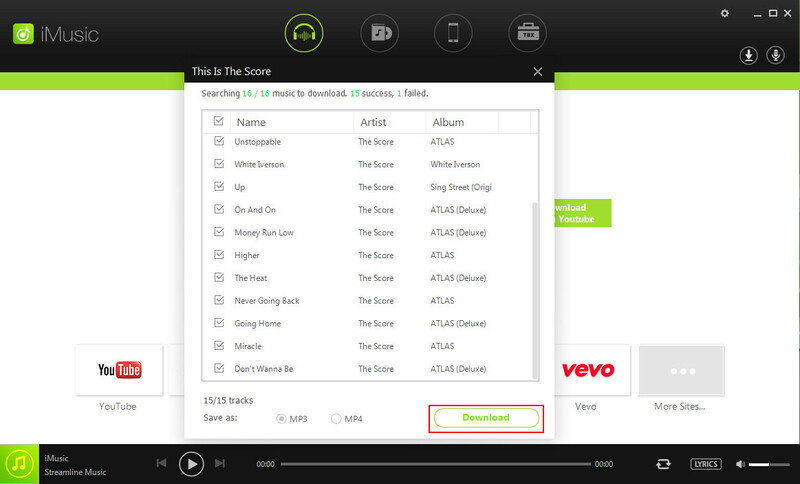 iMusic will need your approval for it to be able to access the files on your device and your iTunes. This is to confirm that there would be no duplication of data when it is passed to and from the phone and your PC. 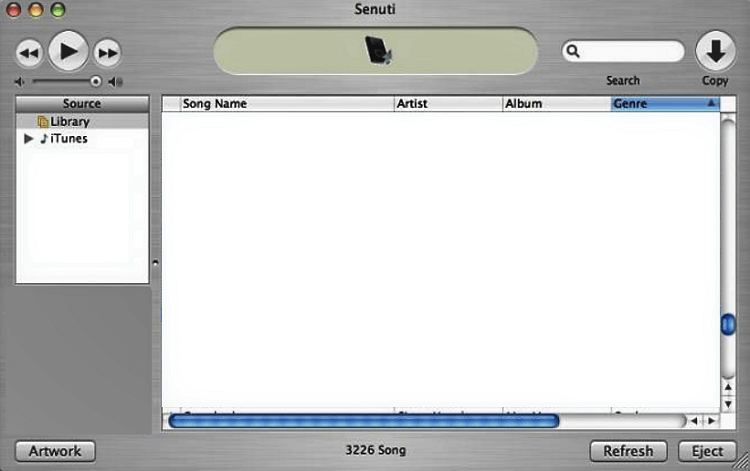 Click Start in order to allow iMusic to scan both of your devices. The only thing left for you to do is to select the files on your device that you want to transfer to your iTunes library. 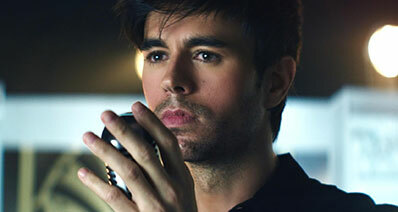 Once you’ve chosen, finish it up by clicking the Copy to iTunes button, and you’re good to go! Price: $39.95 per year (up to $79.95 per year for business license). The second transfer app on this list is dr.fone. In reality, it’s pretty much on par with what iMusic offers. At least, in terms of available features and amazing design. However, it’s a much bigger program too, and because of that, is much more expensive (you’ll have to pay the subscription price in order to be able to use it.) If you’re looking for a program for all your transfer needs, then you might be interested in dr.fone. Just know that it costs just the slightest bit more than the rest because you’ll be paying for the full premium package. Feature-packed software with premium and advanced transfer/restoration tools. Transfer data efficiently and intuitively with media transfer . Repair, Restore, Erase, etc. with premium data management tools. Subscription-based (Full/Permanent License is unavailable). FREE trial available but limited in features. Expensive yearly payments required — $39.95 per year minimum. Although a lot more basic than the first to programs that we introduced, Syncios does deserve acknowledgment. The fact that it is simple does not necessarily make it worse than the program above it. It’s just a matter of preference and how the user wants to be able to use their data transfer app. In the end, the important feature here is the fact that it will allow you to transfer, recover, and manage media between your device and your PC. 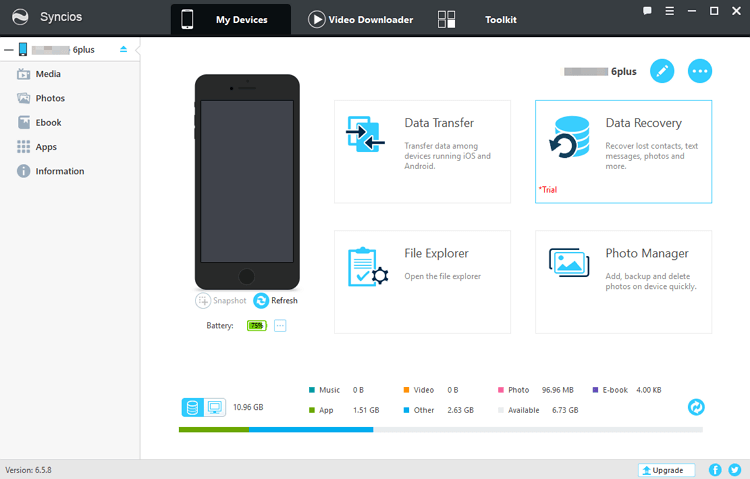 Automatic & Manual Data transfer between device and PC. Data Recovery and Restoration tools. Media transfer tools available for audio, video, contacts, etc. Offers a Limited FREE trial that locks certain tools. Full License costs $29.95 up front. Was created primarily for music transfer, which is why transferring other types of data might not go as smoothly. Price: $39.95 per year (Subscription-based) OR Full-License for $49.95. iCareFone is similar to Syncios in that it is just the slightest bit more basic than the programs above it. That does not make it worse, but it definitely doesn’t make it better. Especially when you consider the premium price tag attached to it. As of right now, iCareFone is unavailable to beat the others in terms of interfacing and design. However, if it is all you have access to, then the important part is that you will be able to use it for media transfer for most modern devices. Media Transfer compatibility for iOS and PC . Restoration and Recovery tools available in case of data loss. Other Media Transfer tools are available for videos, photos, contacts, etc. iCareFone does offer a FREE trial, but it locks certain features. Subscription-price and full-license is expensive. Its premium price tag does not necessarily match up with its basic design. Price: (Subscription-based) 49.95 per year. Like dr.fone, iTransfer is completely subscription-based. This is a type of cost that really piles up over time, and that is why it is much lower than the other programs on this list — even though its capabilities are primarily the same. In fact, you shouldn’t see much of a difference between this program and “iMyFone” (which we will introduce later on.) Some might argue that the premium price tag is due to its extra media transfer capabilities (not just for music but also photos, videos, contacts, messages, etc.) However, that is not such a big feat. Automatic transfer of music from iPhone to Computer. Premium toolbox for managing data. Subscription-based program (yearly payments required). The minimum cost of subscription costs $49.95 per year. 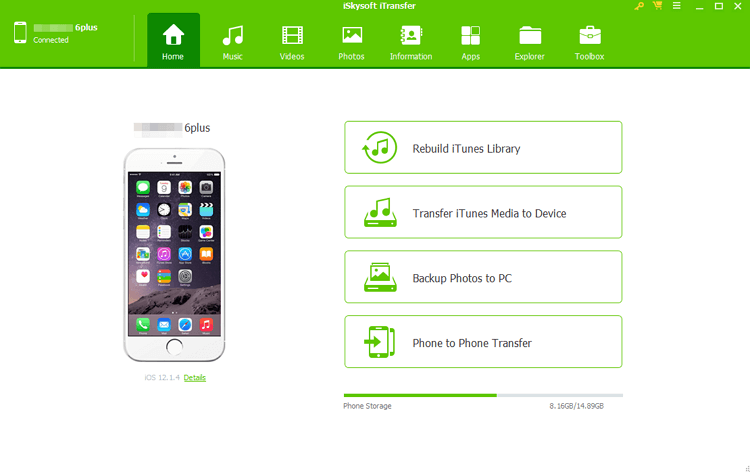 For our next list, we’re going to be introducing you to Mac transfer apps! Just remember, that most of the programs we introduced in the Windows list are available for Mac as well. 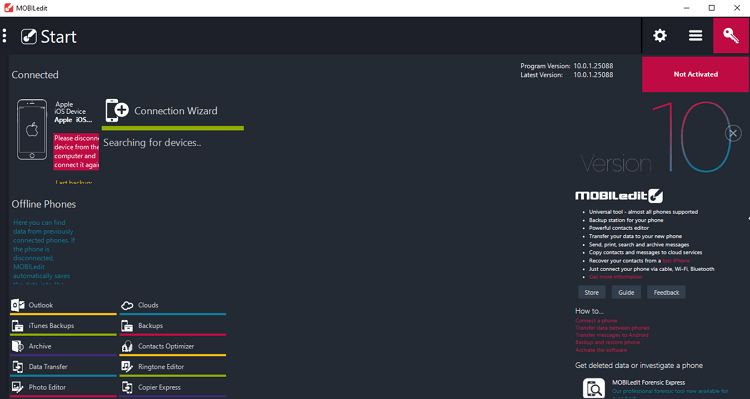 So, this list might not be entirely accurate when it comes to the best program you can use on a Mac. However, it will still introduce you to 5 completely new transfer apps that you can use in order to transfer music from iPhone to your Mac PC. The first transfer software on this list, surprisingly enough, is free. Don’t celebrate just yet, however. It will work in a pinch, it’s meant to be a program that you use for basic and simple transfers. Still, for a beginner, despite its non-complicated interface, it might be a little difficult to use. It’s a lot older than some of the other programs as well — making it slower and unfortunately not as compatible with certain devices. So. if you use it, make sure to keep those features in mind. 100% FREE music transfer app. 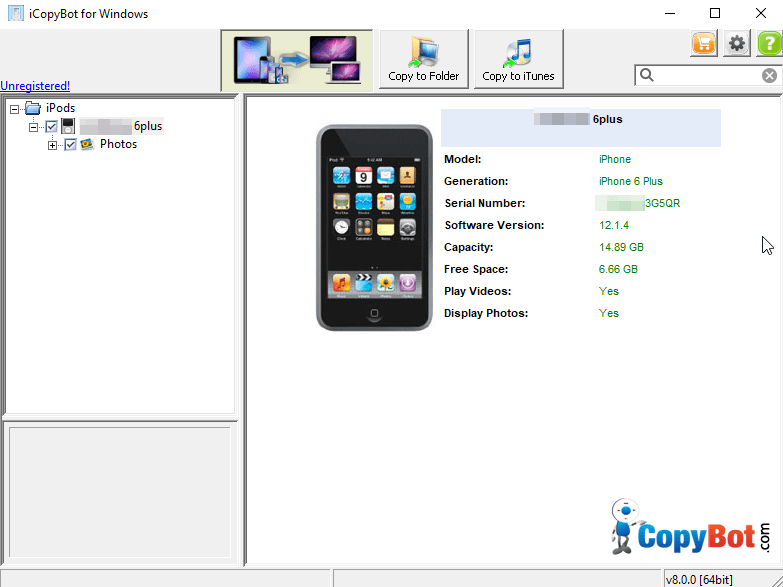 Transfer between an iOS device and Mac PC available. Limited only to Mac OS Computers. Lacking heavily in premium and advanced features offered by other programs. Is not compatible with certain iOS devices . Again, we have yet another FREE program with MOBILedit. It is, similar to Senuti, a bit troublesome in some cases. The fact that it is free earned it a fairly high spot, but because it is open-source, it’s definitely lacking when it comes to certain features that we’ve come to expect with the types of software that we use. The overall takeaway here is that it is there if you need it, but it’s not something we’d recommend for beginners who want to be able to transfer their music quickly and without any unnecessary stress. FREE (no-restriction or trial period) . Media transfer between iOS and Mac PC is available. Complex interface that is not suitable for beginners. Lacking in advanced or premium transfer managing tools. Much like most open-source programs, it is known for bugs and periods of uncooperativeness. Two-way transfer capabilities between iOS devices and Mac PC. Available both for Mac & Windows OS. Limited FREE trial available that locks certain premium features. Full program cost is $29.95 for the full license. Certain iPod, iPads, iPhones, etc. are not supported (be careful as you might not be able to use it for your own device). iMyFone is the program we mentioned earlier when we introduced iCareFone. As we said then, the two programs are honestly very similar. The way they’re built and the pricing for both programs are identical. The only difference lies in the design choice (which is really just a matter of preference at this point.) In the end, much like its twin, it’s not necessarily a bad program. It’s just the fact that you have to consider the cost and whether its basic interface is worth such a premium price. 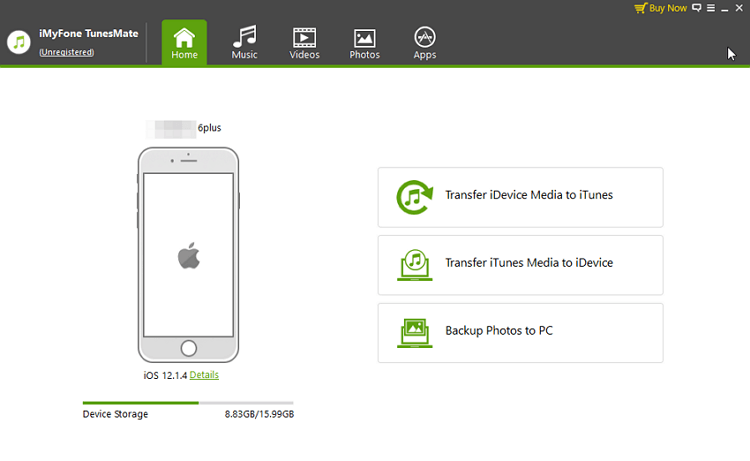 Media Transfer available for iOS devices and Mac PC. Data Management tools provided for adding, removing, exporting, etc. data. Simplest interface created to be highly user-friendly. Offers a Limited FREE trial (locks certain features and tools). 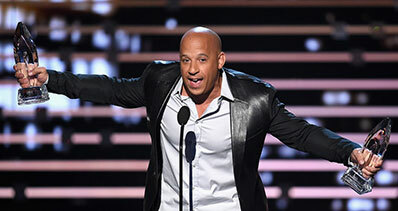 Requires either a yearly payment of $39.95 or an up-front one-time payment of $49.95. Lacks certain advanced or premium features offered by other music transfer apps that precede it. 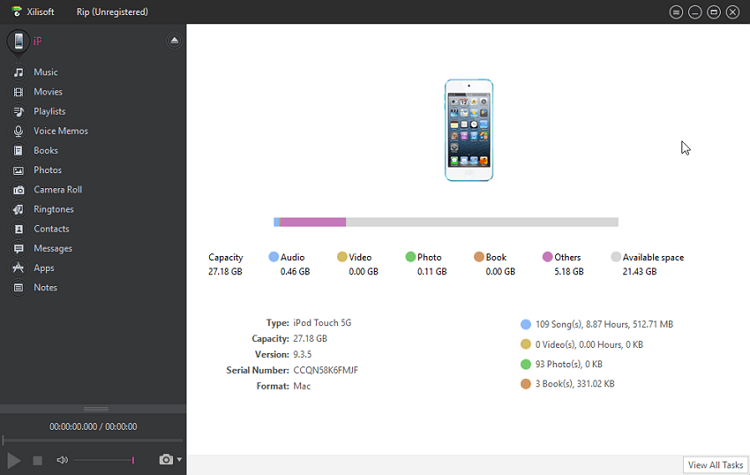 Manages data transfer between certain iOS devices and Mac PC. A straight forward transfer process. Lacks any premium or advanced media transfer tools. Incompatible with certain iPod, iPad, etc. generations. Much like most open-source programs, it is prone to bugs and lagging — which can greatly disrupt workflow and create unnecessary stress. Automatic transfer of iPod music to iTunes library. Conclusion: Thus, concludes our quick compilation of the Top 10 Best Music Transfer Apps for transferring music from iPhones to a Mac or Windows PC! As you’ve no doubt learned, there are many available out there. It’s just a matter of finding one that will suit you the most. However, if you want a blanket recommendation (one that will work for people of all types — the inexperienced, experienced, etc.) The program we’d suggest trying out before anything else is the iMusic transfer software. It is, without a doubt, the most helpful program. Especially for transferring music from iPhone to a Mac or Windows PC!